Malta scuba diving sites at Blue Grotto are the East dive and the West reef and caves. The offshore dive the Um El Farouk artificial reef. At Ghar Lapsi, a few kilometers away by car you can explore the caves where it is ideal for new beginners. All dives can be taken all year round all depending on weather permitting. Arriving at the Blue Grotto proceed as much as far down the hill very close to where the boats leave for the caves. After preparing yourself proceed for the dive. Before entering the water observe for the position of the steel ladder which is usually on the right side of the bay. In bad weather this ladder might come off and s plan your air use to go further in to the slipway and come out. On the east side of the harbour you enter the water and it is immediately a 35 meter drop. Going further to the left you will see a cliff wall with colourful sponges which can be explored from where you return back the same way. At this point be careful from the Blue Grotto boats going out of the harbour. At the point form where the boats leave you will observe many large boulders where in between observe large fish like Brown Meagers, Grouper and Beam. For the last part of the dive at the shelve positioned at 9 meters depth you will observe octapus and very brightly small coloured fish. On arrival proceed as already instructed in the previous dive. 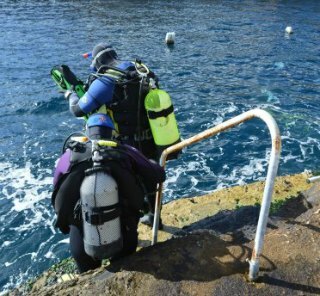 This dive is very popular and starts with an entry into the water from a small, narrow quay. The position of the steel ladder has to be observed since bad weather usually pulls it off. This will be necessary when you complete the dive and has to return to shore. On entering the water within the inlet proceed to 10 meters swimming across to the far end of the inlet towards the open sea. Proceed on the west reef to your right. Down to 27 meters on the sandy bottom and follow the natural contours. After a short while you will meet the bell tower cave having three narrow entries where the largest is at 27 meters. Here you can see many Cardinal fish and you can be with another one or two divers inside the cave. Along the way we meet a variety of fish namely painted combers, damsel fish, rainbow and turkish wrasse, saupe, goatfish, scorpion fish may be a seahorse. After exploring this cave proceed to 25 meters where you find another but larger cave. After exploring this one start going back the same way as you have come here. Proceed to the steel ladder or slipway as necessary. One other Malta scuba diving sites found at Ghar Lapsi located a few kilometers from Blue Grotto. The site is accessible from the sea level inlet. You go down a short steep road and at the side there is a small space where to park and dress up for the dive. At the top of the road beside the restaurants there is an ample public parking area. 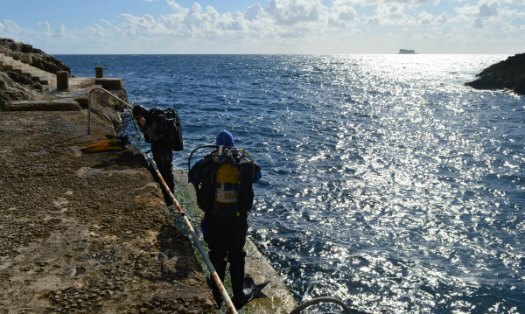 This location is great for cave dives and ideal for beginners where you can start your dive either by ladder or by the slipway. The quiet shallow water at Ghar Lapsi inlet is well frequented by locals and tourists for swimming and it is the perfect location for try dives and for new divers. It is also ideal for those divers that wish to do shallow dives. Here new divers can descend on the reef at around 15 meters. The caves for this area, for the more experienced divers. Divers with more experience can descend further and discover the natural beauty of the Azur and green water colour reflections especially with the sun rays reflecting through the entrance around the caves. Ideal for underwater photography while the sun reflects through the entrance.